In 1978, between the momentous abolition of the maximum wage in 1961 and the present post-Bosman era of player power and unrestricted movement, came a decisive shift in football’s transfer market. Players were entitled to turn down new contract offers at the end of their term, and given the right to negotiate directly with a willing buyer. 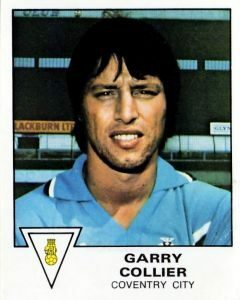 Gary Collier was the first player in the Football League to take advantage of the newly-relaxed regulations on freedom of contract, which allowed him to complete a transfer from Bristol City to Coventry City in 1979, set by tribunal for a then-club record fee of £325,000. Collier’s time at Coventry was brief, and largely unsuccessful; however, he was sold in the spring of 1980 at a profit to the Portland Timbers of the North American Soccer League (NASL), a well-worn trail for First Division players of the time. While Collier played on for another decade in the USA’s indoor and outdoor leagues, the repercussions of his initial move under freedom of contract were felt by his home-town club. 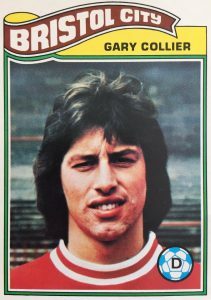 At Bristol City, centre-half Collier had been an integral part of a team which had reached the top division in 1976 for the first time since 1911, under manager Alan Dicks. The side was built around of a group of young, locally-born players which, supplemented by the experience of ex-England internationals Terry Cooper, Norman Hunter and Joe Royle, survived for four years in the First Division. Dicks was so incensed at losing one of his best home-grown players for what he saw as a paltry fee due to freedom of contract (the era of million-pound transfers was by then well underway), that he immediately signed six members of his squad on unprecedented eleven-year contracts. At the start of the 1980s, Bristol City were reckoned to have the third-highest wage bill in the top division, behind only Merseyside giants Liverpool and Everton. Of course, it was unsustainable, and demotion from the First Division at the end of the 1979-80 season proved to be the first of three successive relegations; crippled by debt and with players under long-term contract, the club was in freefall. Dicks had been sacked during the 1980-81 season, replaced by Bob Houghton, an Englishman who had led Swedish club Malmö to the 1979 European Cup Final and brought in his compatriot Roy Hodgson as assistant, the latter having also enjoyed success in Sweden with Halmstad. Houghton was, almost inevitably, unable to arrest the decline, and by the time Hodgson took over as manager in January 1982, Bristol City were in the Fourth Division and on the verge of bankruptcy. As a result, eight players – former captain Geoff Merrick, Gerry Sweeney, Dave Rodgers, Peter Aitken, Chris Garland, Trevor Tainton, Jimmy Mann and Julian Marshall – were pressured by the Directors to give up their contracts. Though none were on huge wages by modern standards, nor were all on the eleven-year deals, they were the eight highest earners in the squad. 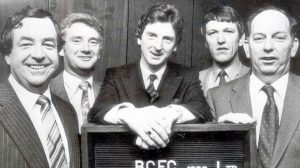 With the club minutes from ceasing trading on the morning of 3 February 1982, the eight players (several of whom were stalwarts of the pre-First Division seasons) agreed to cancel their contracts for a fraction of their value, in a deal brokered by the PFA; the compensation was reckoned at £58,000, plus the proceeds of a benefit game. Whilst all found other teams, Merrick and Tainton – with the best part of a thousand appearances for Bristol City between them – never played League football again. The crisis led directly to the introduction of the Football Creditors’ Act, ensuring that when a club goes into administration, paying players and other clubs takes priority over external creditors. The players remain known as the ‘Ashton Gate Eight’, and are held in high regard for their sacrifice to secure the future of the club. Though Bristol City’s fortunes have revived, the lessons of this cautionary tale were not learnt, as a host of clubs living beyond their means, spending lavishly on transfer fees, offering long-term contracts and unsustainable wages, have discovered in the years since. A comprehensive article on Bristol City’s rise and fall in the late 70s and early 80s can be found at These Football Times.